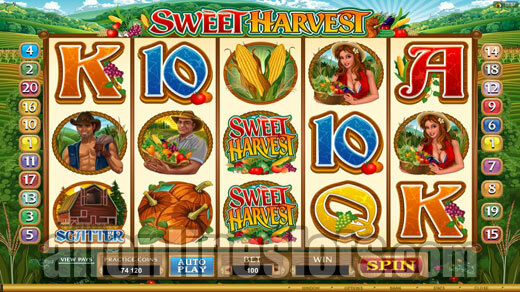 Sweet Harvest is a 20 line Microgaming video slot with a farming theme. The game features stacked wilds on all reels which can lead to some big wins although it is a bit of a let down that the highest free spins multiplier is just X2. 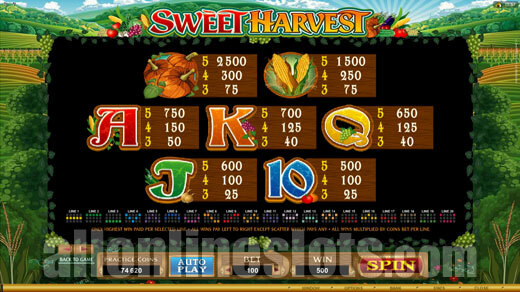 Sweet Harvest is a 5 reel, 20 line slot machine found at all Microgaming casinos. 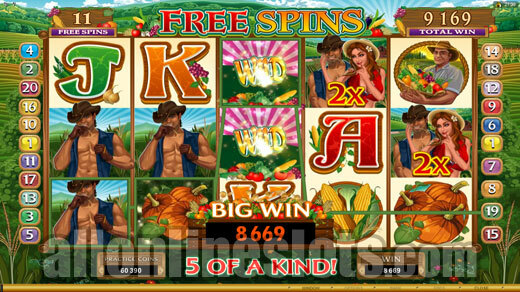 The game has a farming theme and features stacked wilds, a re-spin bonus, free spins and an instant win bonus. Coin sizes start at 0.01 and maximum bet is 100 coins per game. The Sweet Harvest logos are wild and appear stacked on all reels. Getting five of a kind of wilds pays 2,000 coins per line (10,000 coins at max bet). This might not be the biggest jackpot but as you can get this same pay on all 20 lines you can win an impressive 200,000 coins * on the base game. The first feature on Sweet Harvest is a reel based bonus. Look out for the basket symbols on either reel2 or 4 as these are the key to this bonus. Getting one or more awards an instant win prize of between 2 and 10 times your total bet. 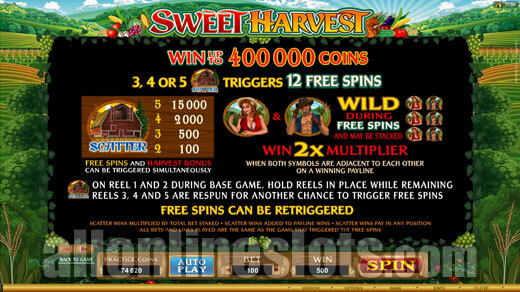 The second bonus on Sweet Harvest is the free spins which are triggered with the scattered Barn symbols. Get three or more anywhere on the screen and you win 12 free spins with extra stacked wild symbols and the chance at double wins. The game also has a re-spin feature where if you get a scattered Barn anywhere on reels 1 and 2 the rest of the reels re-spin once which gives you an extra shot at winning the free games. We like the re-spin bonus as it effectively doubles the chance of a bonus win. During the free spins the Farm Girl and Farmer symbols are wild and can appear stacked on all reels. This gives you a much better chance of hitting the full screen of wilds on the free spins. Oddly there is no automatic multiplier during the free games which is a bit of a disappointment. Instead you only get a X2 multiplier if the Farm Girl and Farmer appear on adjacent reels as part of a winning combination. Get luck and you can win up to 400,000 coins on a single spin during the free games which is quite a n impressive jackpot. Of course this is not going to be happening too frequently so we would have preferred to see a higher multiplier on the free games which would have reduced the volatility a bit. The good news is that the free spins can be re-triggered. Overall, Sweet Harvest does not really offer anything new in terms of game play. We like the stacked wilds and the big top jackpot but are not really fans of the fact that most free spins wins will not have any multiplier.